Jeff Maxfield has had his hands in the culinary arts from an early age, learning to shuck oysters at Hood Canal with his grandfather and making his mom elaborate breakfasts. “I used to take my mom’s breakfast order in bed and make her French toast and sourdough pancakes from a 30-year-old sourdough starter she had," Maxfield says. At age 20, Maxfield became the sous chef and youngest restaurant manager ever at the famed Queen Anne restaurant Canlis. 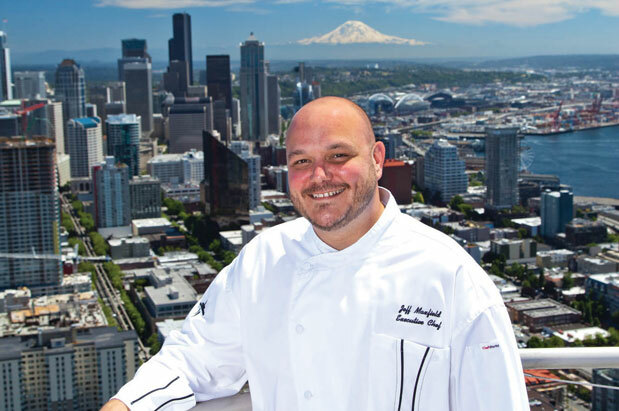 Now, he's the executive chef of SkyCity, the iconic restaurant located atop the Space Needle with arguably the best mealtime views in the city. On October 8, chef Maxfield will join forces with FareStart for Guest Chef Night, a Thursday evening event in which well-known local chefs give students valuable hands-on training while cooking meals for a full restaurant. You can make reservations here. Who or what was your inspiration to start cooking? My mother was a home economics teacher and amazing in the kitchen and my grandmother was a great cook as well. Working with such great people and meeting people from around the world. What is one exciting thing happening at SkyCity lately? I always get excited about the fall produce and the return of the wild salmon to our local rivers. We are adding a tasting menu of sorts to our dinner program that will give our guests the opportunity to try smaller portions of our dishes. What factors play a role in deciding what goes on your menu? I’m a big believer of creating dishes with products that are found within the same geographical region during the same season. For example, wild salmon from the Olympic Peninsula with chanterelle mushrooms foraged from the foothills of the Olympic Mountains. What dish on your menu right now would you recommend to a Seattleite who has never been to the restaurant? I would have to suggest trying one of our steaks. We aren’t known as a steakhouse, but I would put one of our steaks up against any of the top steakhouses in the city. We use Meyer Ranch’s Red Angus Beef; it’s USDA prime and it's incredible. They are 100 percent genetically traced Red Angus cattle. The program has a great story and yields some of the best beef in the country. How do you deal with the long hours and stress that tends to come with being a chef? What motivates you? This business is all I know so I don’t mind the long hours and stress too much. My wife was in the business as well and that makes it a lot easier. I don’t work late nights much anymore; I make sure I’m home every night to put my daughter to bed. You get to work in one of the coolest locations in the city, but I imagine it attracts a lot more tourists than locals. How do you handle that? Do you have any regular customers? We certainly are the coolest building in town. A big part of our business is from traveling guests and that’s pretty cool. We get to meet people from all over the world and show them the Pacific Northwest through our eyes. We do have regular visitors that count on us to create memorable experiences for their special occasions, which is great to be a part of. What is one goal you have for the future of SkyCity? My goal for SkyCity is to put it back on the map (during the off-season of course) as a local option for dining. It’s amazing to hear from people who come up and have lived in Seattle for a long period, how amazed they are about the food and the view. It’s almost like being new to the city. What is one thing you are really proud of in your career so far? I am most proud of being a steward of sorts for the bounty of the Pacific Northwest to visitors to our region. Secondly, I work in the coolest restaurant in Seattle! What are a couple of your favorite places to eat in Seattle? With a toddler at home and a new baby on the way in a few weeks, we don’t get out too often, but if we do, we head to Ballard and hit up a few places for appetizers, usually starting at The Walrus and the Carpenter. What’s your favorite meal to cook for friends? Lately, I make lumpia from a recipe I got from a friend's grandmother in Hawaii. It’s one of the cravings my wife has had during her pregnancy. We have been doing a lot of appetizer-type stuff as well with friends, five or six different things that we can all hang out in the kitchen and eat while watching all of the little ones run wild. Not too formal. Watching my daughter grow has taken precedence over all else over the last few years; however, I am an avid sport fisherman and love the outdoors. If one of your kids grew up and told you they wanted to be a chef, what advice would you give them? I would encourage them to get the business and management/leadership background through an associate's degree or something similar. It's easy to learn to cook; it's much harder to be a great leader. Nowadays in this business, chefs are only as good as the team they have. You can be the most creative and innovative chef but [you have to] keep a good team motivated and willing to work hard for you. Being a good business person is equally as important. If you can't make the business money, there’s no reason to do it.